Clive is Emeritus Professor of Archaeoastronomy in the School of Archaeology and Ancient History at the University of Leicester, UK. He has worked in many parts of the world and published numerous books, papers and articles including the 3-volume Handbook of Archaeoastronomy and Ethnoastronomy (2014), for which he was editor-in-chief. He has ongoing fieldwork and analysis projects in Hawai‘i, Peru and Europe and is a leading figure in the joint initiative by the UNESCO World Heritage Centre and the International Astronomical Union working to recognise, protect, and promote the world's most important astronomical heritage sites. He was awarded the Royal Astronomical Society’s new Agnes Clerke Medal in 2017 for a “lifetime of distinguished work in the overlapping areas of archaeology, astronomy and the history of science”. An international expert meeting took place in Gran Canaria, Spain, on May 23–24 which brought together the Astronomy and World Heritage Initiative and UNESCO’s thematic initiative on Heritage of Religious Interest. The aim was to identify and reinforce the close linkages that exist across human cultures between religious/sacred traditions and celestial knowledge, and the clear connections between sacred sites and the skyscape. The meeting issued a set of recommendations (available in English and Spanish) aimed at recognising, respecting and helping to preserve such sites, including through the World Heritage process. The Stonehenge landscape, part of the Stonehenge, Avebury and Associated Sites World Heritage Site, is internationally renowned for its complexes of outstanding prehistoric monuments. The A303 trunk road cuts across this landscape, passing within 200m of Stonehenge itself. Highways England is seeking to improve the road so as to remove a bottleneck where it runs through the World Heritage Site, including the construction of a twin-bored tunnel at least 2.9 km (1.8 miles) long. 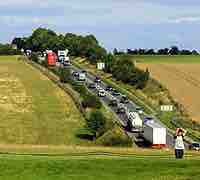 This would eradicate the road and its traffic from the part of the landscape visible from Stonehenge and mean that major highways no longer obstruct the route of the Avenue. Initial concerns that the western tunnel entrance would be sited on the winter solstice sunset sightline from Stonehenge have been addressed in the latest scheme, but many issues remain to be addressed. In particular, as argued in consultation feedback from a consortium of Stonehenge experts submitted on April 23, there would still be irreparable damage to the wider Stonehenge landscape by building substantial new tunnel approach roads within the World Heritage Site boundary. At the request of Highways England, a new Scientific Committee, chaired by Professor Sir Barry Cunliffe, has been set up to provide guidance on design and implementation proposals as they are developed and to monitor their delivery so as to ensure minimum impact on the the historical environment and upon the Outstanding Universal Value (OUV) as recognised by UNESCO. Further information and updates are available on the Committee’s website. Heiau, ‘Āina, Lani: the Hawaiian temple system in ancient Kahikinui and Kaupō, Maui, by Patrick V. Kirch and Clive Ruggles is due to be published by the University of Hawai‘i Press, probably early in 2019. The book represents the results of a joint fieldwork project by the two authors, spanning more than 15 years, in the south-eastern coastal area of the island of Maui. There is a remarkably well preserved archaeological landscape here containing pre-conquest house sites, walls and terraces for dryland cultivation, and including scores of temple sites (heiau), many of which are newly discovered and reported in the book for the first time. Heiau, 'Aina, Lani is a collaborative study of 78 temple sites in the ancient moku (districts) of Kahikinui and Kaupō. The title of the book means "Temples, Land, and Sky" and reflects the integrated approach taken by the authors, combining archaeological and archaeoastronomical evidence (detailed mapping of the structures, precise determination of their orientations, and accurate dating) which allows them to offer some provocative interpretations of the complex relationships between the Hawaiian temple system, and landscape, and the heavens (the “skyscape”). 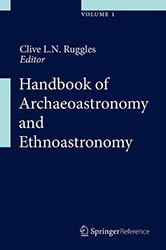 The book repositions the study of heiau at the forefront of Hawaiian archaeology and also demonstrates the successful integration of archaeoastronomy into broader investigations of archaeology and landscape. 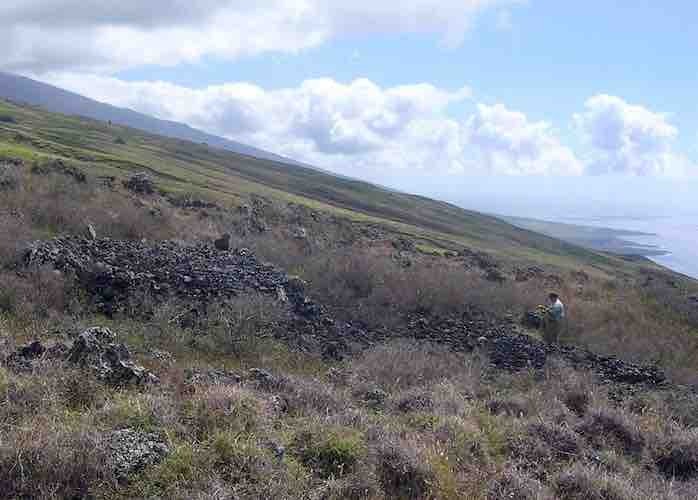 The photo shows temple site NAK-30 in its landscape setting, looking eastward along the coast with the southern slopes of the Haleakalā volcano in the distance.